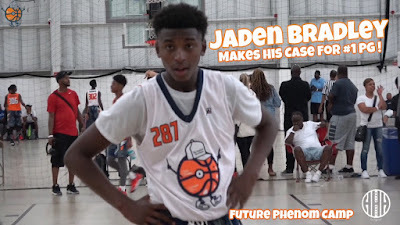 BASKETBALL SPOTLIGHT NEWS: Future Phenom Camp Highlights: Jaden Bradley #1 Point Guard In America! Future Phenom Camp Highlights: Jaden Bradley #1 Point Guard In America! Jaden Bradley came to the Future Phenom Camp rated as the #1 player in the land and left with his ranking intact. The lanky point guard simply controls the game with his presence and feel for the game. What’s the most special about him is that he knows how to make his teammates better. Check out his solo highlights from the Future Phenom Camp.